Are you ready for 4K? Manufacturers are, and they are ramping up for the next phase in how we enjoy videos, both on mobile TV and via big screens. There are some hurdles, and although it seemingly took the better part of decade for most countries to transition into 720p/1080p HDTV, the next wave of ultra resolution definitely seems like it is on the fast track. So just how big of a leap is going from HDTV to 4K? It’s big. Current HDTV specs come in at 1280×720/1920×1080, 16:9 ratio and 24p, 30p and 60i. 4K ramps up to a pretty big jump of 7680×4320. The same aspect ratio of 16:9 is in effect, but the frame rate is bumped up to 60p, for extremely high-definition, flicker-free imagery. Companies are going full force with producing 4K sets, but the lack of content could be problematic. And that’s where we come in! The team at ReelDealHD is committed to providing consumers with next level products and services that add to the scarce library of 4K content. This week we are proud to announce that we will be contributing to the advancement of this next level technology and commencing our first 4K project. The beauty in 4K viewing is best exhibited through gorgeous patterns and hues. Because of this, it is fitting that we have chosen to bring the party to life by recreating a nightclub scene packed with dazzling lights and vibrant outfits. Make sure to stay connected with ReelDealHD in order to get more information on 4K as well as a behind the scenes look at this weeks shoot. Knowing what you want to achieve is an important first step for any successful YouTube marketing strategy, and it’s no different when it comes to launching an advertising campaign. Whether you want to increase a video’s view count or drive viewers to off YouTube pages, having a clear objective at the outset will help you determine where, and how, to position your ads. Pairing the right ad placements with your specific objective is the most fundamental way to make sure you’re getting the most value out of your marketing budget. Here’s a brief guide that lays out which ad formats to use for some of the most common KPIs on YouTube. These ads will appear as promoted suggested videos in the search results page. Once a user clicks on the video link, the view will increment as soon as that video begins. These ads appear as promoted suggested videos in the related videos column. Like “In-Search,” the view increment is counted after a user has clicked on the video link and the video beings to play. The TrueView ads can also help build an audience on your channel. If a user sees your content as a TrueView ad, they are more likely to visit your channel and watch additional content, garnering you “earned views” as a result of your “paid views.” Furthermore, if a user really enjoys your content, they will occasionally subscribe to your channel. These ads are specific to YouTube only and appear on the lower third of a video. They can support a 300×250 companion banner on the right side of the page as well. These ads are relatively inexpensive to run and can be especially effective when used against remarketing lists. As of now, overlays are limited to laptop/PC inventory only. These ads appear on the right side of the watch page, as seen in Ellen screenshot above. Most online marketers will have this unit created already, so they’re fine to use if it’s the only available creative. However, 480x70s are far more effective and can run the 300×250 alongside it for no additional cost. 300×250 banners are also limited to laptop/PC inventory only. These ads appear throughout the Google Display Network (GDN) as contextual placements to complement a search. These ads are usually able to run at a low price point but don’t often drive conversions at scale. So, before you charge headfirst into your first marketing campaign on YouTube, consider what your goals are and build your creative accordingly. Deciding where to focus your efforts becomes that much clearer, leading to more valuable results, reeldealhd – bespoke video production can help you with this process, with affordable TrueView commercials and bespoke video production services. Why not let us help you make your marketing budget go further? Email Robert Baldwin or call +44 (0) 7922 138 666. It’s Wednesday again and it’s the peek of the week! Start creating your story with one of our clips and get in touch to license our content or to become a distributor and sell our 6000 Royalty Free Premium HD clips in your territory. Graphic Design USA’s 27th annual Stock Visual Reader Survey has revealed that 95% of creatives in the U.S. use stock visuals to some extent in their work. In 1986 only 34% of creatives used stock, but there has been a steady year-to-year rise in its use reaching 95% in 2010. It goes without saying that creatives today work in and across multiple media. Not surprisingly, they license stock in and across multiple media as well. 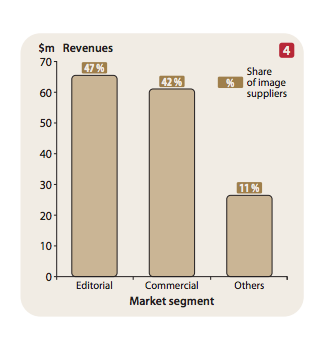 Print remains the number one medium for stock is licensed, and other print-related media such as point-of-sale and packaging also generate lots of stock usage. But, of course, stock elements for online design continue to soar and motion graphics, such as film, video and television make their presence felt. Client feedback encouraged stock agencies not be afraid to move into multi-media images mixing photography, video images with graphics. This is apparently something they only dreamed about but would like to see become reality. Are you looking for contemporary stock video for your next project? ReeldealHD has a premium collection of over 6000 HD Royalty free lifestyle and business clips ready for licensing, and Greenscreenfilms a further 500 for unique projects. Feel free to contact us now. There are currently more TV sets in China than there are people in the USA, and potential locked in to its vast 1.4 bn consumer base. The Ministry of Industry and Information Technology of the People;s Repubic of china states that there were 1.1. billion mobile phone users in the country according to the released figures in December 2012 it also revealed that China boast well over half a billion internet users, that’s the worlds largest online populations. Of those netizens an impressive 91 percent are busy connecting on social media sites. Focused on this emerging market we launch our royalty free stock video collection “East meets West” with 223 brand new HD clips. The Guardian worked with Bartle Bogle Hegarty, the publication’s agency of record, on the campaign. The agency also created the provocative “Three Little Pigs” campaign for the newspaper in 2012 that featured a modern day retelling of the children’s story with the pigs at the center of a media firestorm. 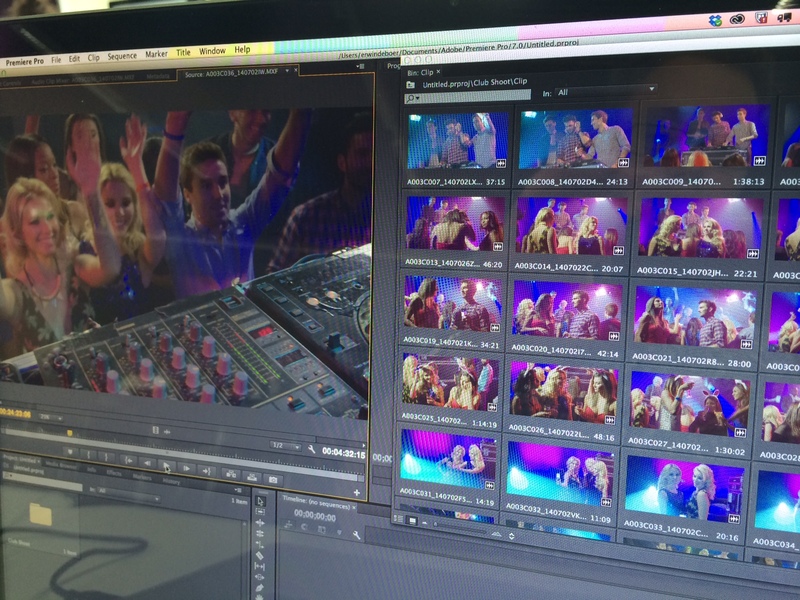 Using stock video can be an affordable and time consuming option. 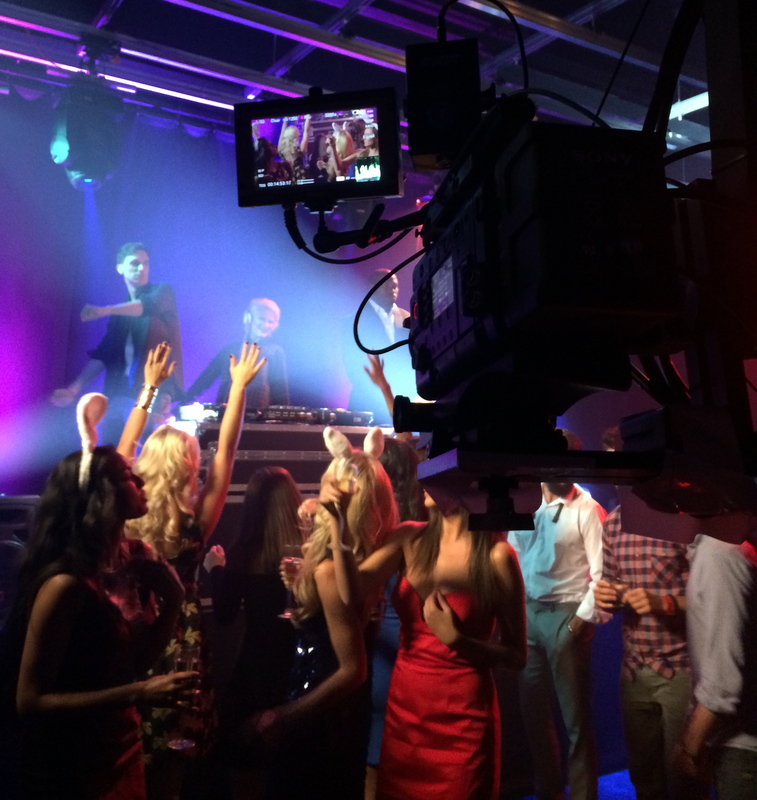 The new commercial by BBH “Own the weekend” includes a number of ReeldealHD stock video clips. Please contact erwin@reeldealhd.com if you would like to use stock library footage for your next project or require a bespoke video production. In 2012 the GSIM Research Group carried out the first ever global survey on over 2,400 image suppliers on a truly worldwide basis. 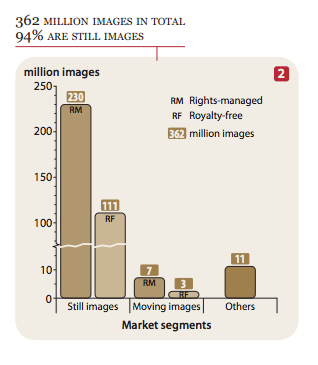 With a response rate of over ten per cent, the survey covers detailed information on 250 image suppliers that commercially trade usage rights on pre-produced still (photography, illustrations etc.) and moving images (video footages). The findings of this survey are published in a series of three reports of which the first one is now available. The global market estimate is the sum of two components. 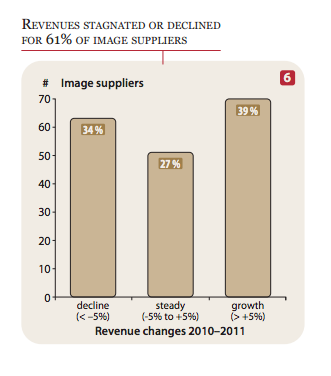 The first component is a projection of the revenues reported in the survey to the global population of image suppliers. This projection has been calculated as conservatively as possible in order to avoid overestimates. Based on the measure of median rather than mean revenues, the model predicts individual revenues for different segments of firm-sizes. According to the estimate in 460 micro (single-member) companies generate $17 million; another 1,077 micro firms achieve $272 million, and 397 small firms gain $1.03 billion. The combined revenues of these micro and small businesses add up to $1.32 billion in 2011. The second component includes financial reports on the large players as well as moderate estimates for ten medium-sized firms in our sample. Based on media reports and expert estimates, the four largest suppliers Getty, Corbis, Shutterstock and Fotolia account for a total of $1.4 billion In addition, medium-sized photo agencies such as Dreamstime, Alamy and several anonymous respondents in the survey sample make up for another $156 million. As a result of this composite estimation approach, we calculate $2.88 billion gross global revenues in the stock image market in 2011 . Only 18% according to the research is original content the other material is re-licensed via 3d parties. The research distinguished three large segments in the market: still images (photos) account for 94 per cent of total image stock, while moving images (video footage) and other images represent 3 per cent. Several footage suppliers reported their image stock in hours of recorded content rather than in number of units. Thus, we underestimate the true size of stock video content. 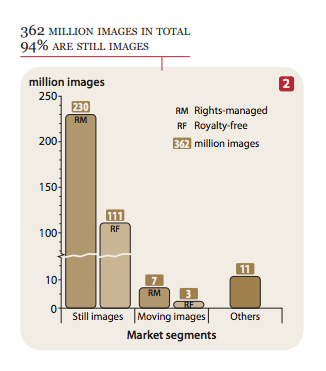 With still photos, traditional rights-managed images (64%) clearly prevail over royalty-free and microstock (30%). So this figure for video seems very low. 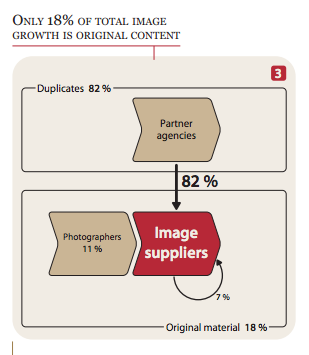 According to the latest available report from Getty in 2008 this was then 11% of their business and the growth specially in microstock footage has been large. I presume only video resellers were not included in this report.